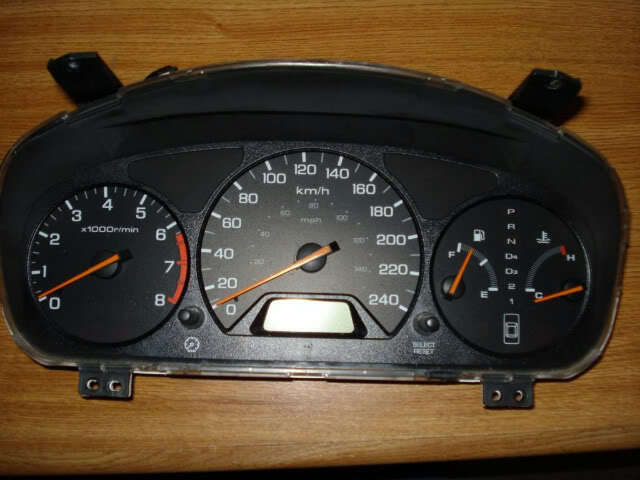 The following are very simple steps by steps for changing Cluster light bulbs on 1998-2001 Honda Accords. Tools you will need to do the job is a short and a long Philips screw drivers. I did it with just a short screw driver. Once these two screws are removed, pull out the plastic insert piece. 2. After removed the plastic insert piece, now remove Screw #3, Screw #4, Screw #5 and Screw #6 as shown below. Keep in mind the the short screws are on top. 3. 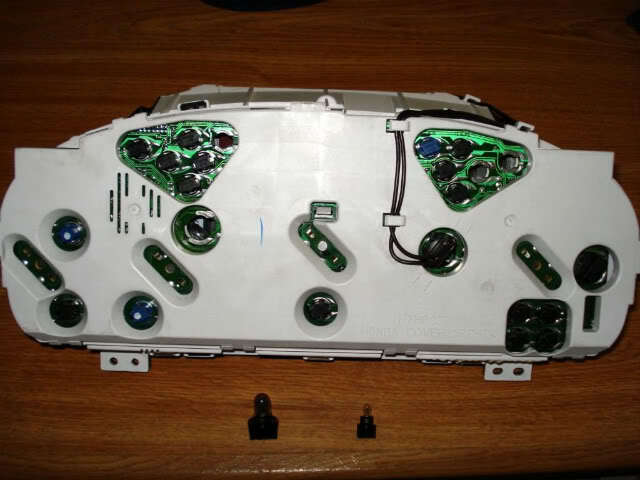 After the above screws are removed, move the Cluster toward you until it is out of the two plastic locator near the bottom. Now tilt the top part of the Cluster down until you see three green connectors as shown below. Disconnect all three connectors. 4. 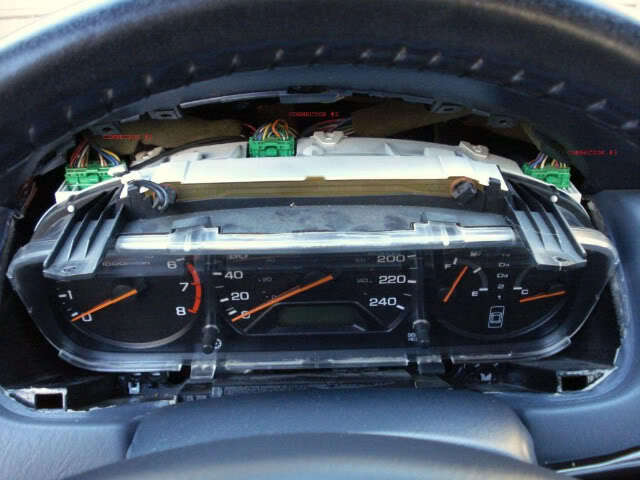 A picture of the Cluster completely removed from the Instrument panel. 5. Below is the back view of the Cluster. Notice that there are two different sizes of bulbs used. I forgot to count the total number of bulbs on the Cluster. My guess is the are at least two of the big bulbs and 12-15 of the small bulbs. My task was just to find out how easy it is to take the cluster out. Now I can shop on eBay for LED bulbs. I hope my finding will help someone who is thinking of repacing his/her Cluster light bulbs. Last edited by deserthonda; 05-31-2010 at 11:39 PM. Super Great DIY - Thank You ! Thank you so much for this informative post. You saved me lots of money. This forum and you guys are freakin awesome. Thanks again! The bulbs are #74 and the base is called V-2 but I had trouble taking the bulb out of the base and took the dive and went to the dealer to buy the bulb and base together ( they dont sell them sepeartely) Since I only needed one I payed the 7 bucks....ouch!! I tinkered with the old base that I had replaced and finally got the bulb out by lifting up the little tabs so the bulb can come out with a little patience. what do you mean by the base? the base of the bulb itself? and aren't there 194 wedge bulbs in the cluster, also? Thanks for the post, now I can get this fixed! This thread made me make an account. 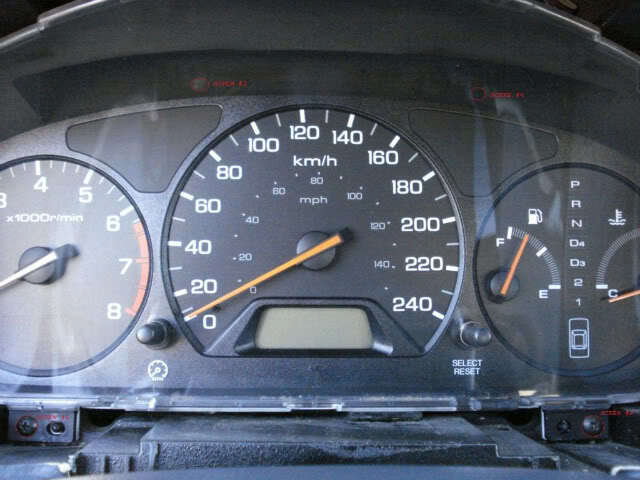 Great gouge--only thing different on my 2000 Accord EX was the low fuel light in the lower left of the panel was a more bulbous bulb with a blue base. I am assuming the larger bulb is to accommodate the possibility of illuminating more often and more a continuous operating light. 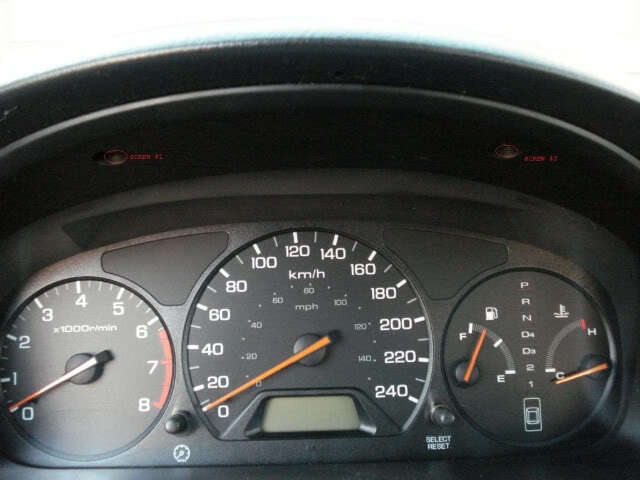 When I installed the one the dealer provided (pt #35505-SA5-003 w/ black base and more like the bulb for the backlighting of the odometer) it did not test when I turn the key to run like all the other instrument cluster lights. Just a quick note for those doing this. Be very careful with the pulling of the unit forward. When replacing the bulbs, LEDs work one way, so if you dont get it right the first time (almost impossible) you are plugging and unplugging the unit a bunch. On mine the green connector on the left broke free from the motherboard, so I have to buy a new cluster, because all the movement, plugging/unplugging caused a short in the board/plug.